In 1981 the United Nations General Assembly passed resolution 36/67 declaring an International Day of Peace. In 2001, the United Nations General Assembly adopted a new resolution 55/282 declaring 21 September of each year as the International Day of Peace. The Assembly declared that the Day be observed as a day of global ceasefire and non-violence, an invitation to all nations and people to honour a cessation of hostilities during the Day. It invited all Member States, organizations of the United Nations system, regional and non-governmental organizations and individuals to commemorate the Day in an appropriate manner, including through education and public awareness, and to cooperate with the United Nations in establishing a global ceasefire. Since 1997, the World Peace Prayer Society has assisted the United Nations Department of Public Information in producing a program for New York school children at UN Headquarters, including a World Peace Flag Ceremony. On Sept. 23, 2002, this program included greetings by Mrs. Nane Annan, Under Secretary-General Shashi Tharoor, and a videoconference with children in five countries that had recently experienced war. The goal of the International Day of Peace Vigil is: "To encourage the observation of a worldwide, grassroots 24-hour vigil for peace and nonviolence on the International Day of Peace, Sunday, 21 September, in every house of worship and place of spiritual practice, by all religious and spiritually based groups and individuals, and by all men, women and children who seek peace in the world." This Vigil is meant to demonstrate the power of prayer and other spiritual observances in promoting peace and preventing violent conflict. Support this worldwide initiative by committing to hold a 24-hour vigil on 21 September. This year, the annual World Peace Festival in Amenia, NY, will be held on Sunday, September 21, 2003. 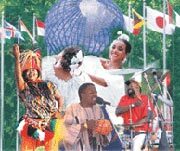 The Festival, always a joyful multi-cultural gathering of music and dance, activities for children, and a magnificent World Peace Prayer Ceremony with the flags of all nations, will serve as a focal point for festivities worldwide honoring the International Day of Peace.